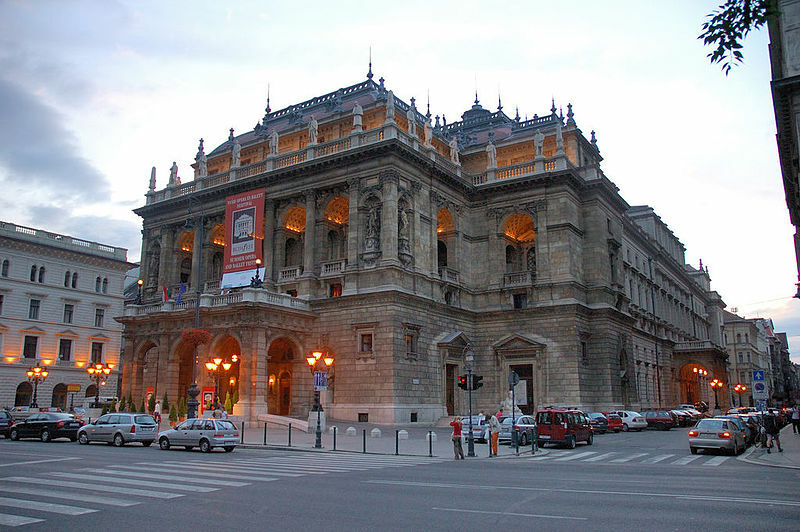 Budapest Opera House is deservedly famous for its exceptional acoustics which made Vivaldi's music played with period instruments audible all the way to the gender chords of the cembalo. Conductor and flautist Pál Németh made the Baroque orchestra play finest nuances, crescendos and diminuendos, powerful horn sections and delicate cembalo accompaniment and the Opera House hall was filled with most enjoyable sounds and harmonies. We sitting in the audience felt satisfied, "this is what Antonio Vivaldi intended!" The feared monotony and boredom of lengthy Baroque Opera with endless recitatives and ABA repetitions was wiped out from the first moment the wonderful overture began and what may have been left disappeared with the red laser light spots playing around and on Tamiri (Meláth Andrea) walking in front of the curtain. During the entire evening the choreography, staging, expressive costumes and overall sense of humor kept the audience awake if Vivaldi had a bit too many notes in his scales. International star Xavier Sabata made the evening as King Farnace with his amazingly rich and beautiful counter tenor voice. I noticed that the intensively delicate aria on the presumed death of his son made many eyes wet in the audience. The Hungarian singers did very well in his inspiring companion, though, with seductive Selinda (Schöck Atala) often stealing the limelight with both her singing and acting, Although Vivaldi composed fairly similar music to each main character, both the strongly profiled interpretations and the imaginative costumes created very distinctive roles. The main star of the wonderful evening was, however, the red haired priest. Because Farnace is a rarely heard opera - at least I have never heard any of it before - the music and singing is completely fresh and original. Some of the arias are truly amazing like the lament of Farnace mentioned above and there are surprising musical pearls in the flow of music "in rivers that find their grave in the ocean". The soprano coloratura aria by Gilade (Ducza Nora) came as a total surprise from the gods or the stars and was worthy of Mozart. Towards the end of the opera the maestro demonstrated his composing skills by giving a loving duet after all those solo arias. Nicely three singers were set to stand by each other to emphasize the oddity of a wonderful trio and the opera ends with a masterly and controlled choir peace celebrating the happy ending. After hearing and seeing Farnace in Budapest Opera House I predict that other Vivaldi operas will be performed on world stages. But there is a caveat - it takes extraordinary talent, musical understanding and sensibility, courage of staging the sets in both interesting and appropriate ways to make these Baroque pieces alive for modern audiences. I doubt that there are many opera houses capable of the feast in the way Hungary State Opera made Farnace an unforgettable experience.